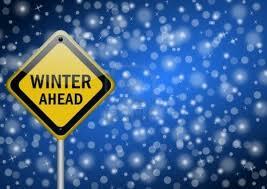 The coldest part of winter is upon us and there is still more to come. Getting caught without sufficient heat in your vehicle can go from being uncomfortable to being downright unsafe, very easily. When adverse weather conditions are expected across the nation, you need warm air coming out of your heater and defroster vents. 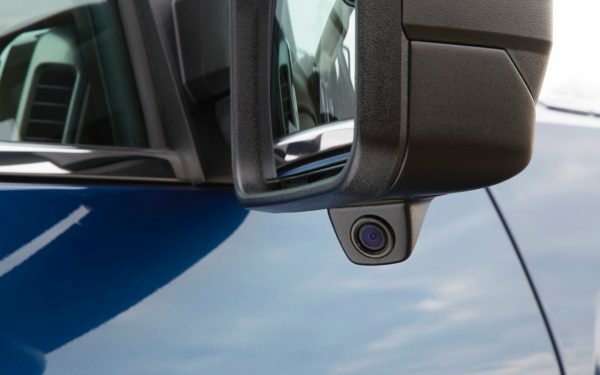 Without it your vision can be harmfully distorted resulting in a major motor vehicle collision and even a fatality. Plunging temperatures can result in impaired driving skills by hampering your reflexes and even causing serious health concerns. The radiator is probably the part most easily associated with the cooling system, simply because this is where the coolant is poured (with the exception of vehicles that use a pressurized reservoir). The radiator serves to cool down hot coolant which is pumped from the engine and through the small tubes in the radiator’s core. 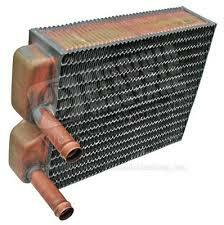 Typically a radiator is comprised of a large core, with many rows of small tubes attached to two tanks on either end. The tanks may be either on top and bottom or left and right, depending upon design and vehicle type. The tanks contain excess coolant waiting to be pumped through the small tubes. As the coolant is pumped through the tubes, ambient air is drawn (by the cooling fan) across the radiators core and slowed by tiny “fins.” The air reduces the temperature of the coolant which is then drawn back into the engine by the water pump. 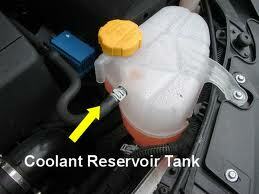 The coolant reservoir (often called an overflow) is designed, as the name implies, as a reservoir for excess coolant. When your engine is running it has a greater coolant capacity; when it is turned off and allowed to cool-down, the capacity grows smaller and excess coolant is purged. The reservoir is there to catch the excess coolant and hold it “at the ready” so that it may be drawn back into the radiator when required. This process is duplicated nearly every time that you drive your vehicle. 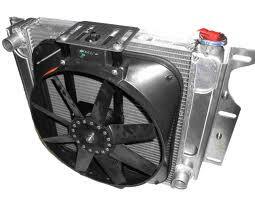 Two primary types of cooling fans are used in passenger cars. Electric fans are controlled thermostatically and driven by voltage. Belt-driven clutch fans are controlled by a mechanical thermostatic element in the fan clutch. These types of fans are driven by the engines crankshaft using a drive belt and pulley. 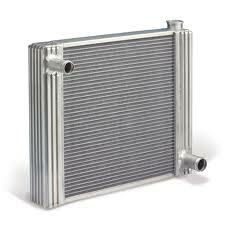 They cool the engine primarily by drawing air across the radiator core, as well as forcing air across the engine. The water pump, which is also driven by the crankshaft, circulates water throughout the engine’s cooling passages, intake passages, cylinder head passages, radiator, and heater core. 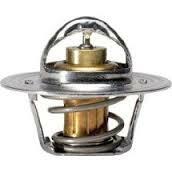 The thermostat restricts flow from the radiator to the engine by opening and closing like a shut-off valve. When the coolant temperature is low, usually below 195-degrees, the thermostat is closed. This prevents the coolant from circulating, allowing the engine to reach normal operating temperature more rapidly. As the coolant temperature rises, the thermostat is gradually opened, allowing coolant to flow freely when it reaches a predetermined temperature range. 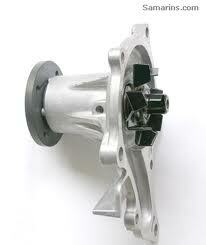 It also keeps the engine operating at a predetermined temperature, by opening and closing as needed. The temperature gauge, or light if your car is not equipped with a gauge, is there to make you aware of impending doom. The gauge should always be below the lowest setting when the car is cold and gradually move upward as engine temperature increases. Watching the temperature gauge should be a routine happening for everyday drivers. The temperature hand should start below normal, proceed steadily to normal, and then drop down slightly. This indicates that the thermostat is operating normally. If your temperature gauge never moves, or remains excessively low or high, then you should have it checked as soon as possible. 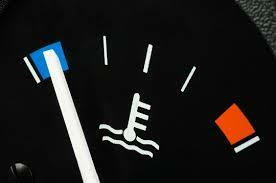 An accurately functioning temperature gauge could be the difference between a minor coolant leak and a blown engine. That brings us to the heater. As coolant begins to freely flow through the engine, it is forced into the heater core. The heater core resembles a small radiator, minus the tanks. Two systems for controlling heater core function exist. The first system utilizes an inline heater control valve. The heater control valve is vacuum operated in modern vehicles; older models were often cable operated. The valve is opened upon command, allowing the coolant to flow into the heater core through the inlet pipe and out of the outlet pipe. 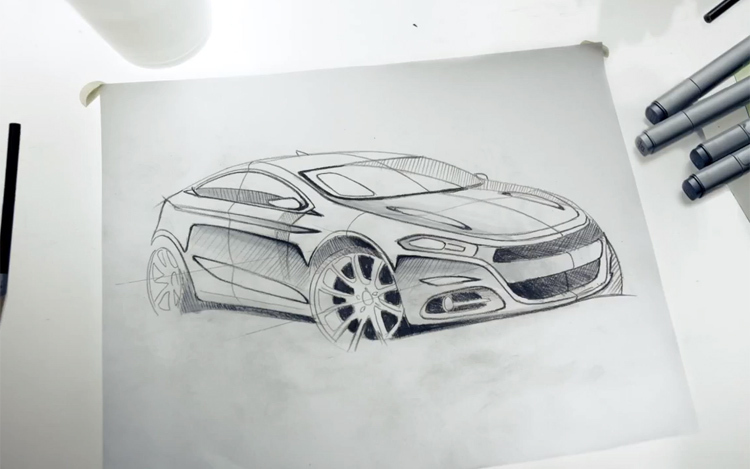 The second design allows coolant to flow through the heater core continuously, and then makes use of a blend-door to switch from heated air to cooled air (and all points in-between) in the passenger compartment. The blower motor is used to push air through the fins of the heater core. The air, exiting the heater core and blowing into the vents is then hot; thus making the entire passenger compartment warmer. The blower motor performs a similar function with the evaporator core when air conditioned air is demanded (more on that in the spring). 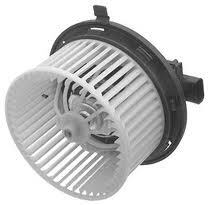 If the air in you car is hot but not blowing from the vents, the blower motor is likely the culprit. Lack of heat in the passenger compartment can be caused by a malfunction anywhere in the engine cooling system. A restriction in flow or coolant leak can hinder or even disable your car’s ability to make heat inside the cockpit. The most common cause of insufficient heating is a low coolant condition. If your engine is low on coolant, the heater core will develop an air pocket resulting in insufficient heating. Here is a check list, just in case your heater is not performing up to par. Check the coolant level. Make sure that the reservoir and the radiator are full. Use your nose; odd smells in the passenger compartment can indicate a faulty heater core. Look for signs of coolant in the floorboard or an excessively fogged windshield when the defroster is used. Pay attention to your temperature gauge. 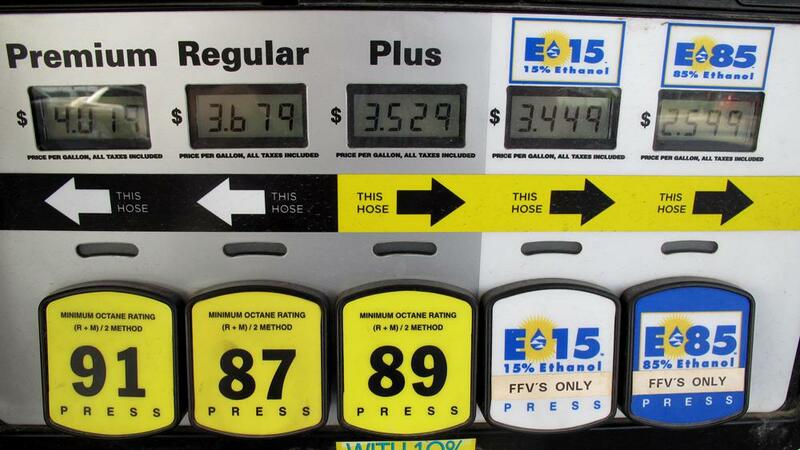 Car Doctor Q & A: What’s the Deal With E15, E85 and Other Ethanol Fuels?